I’m not one for buying DVDs until they drop from full price to something more sensible but I cracked at the weekend and picked up Hot Fuzz with all the shinny extras. I’ll not rave about the main film again. 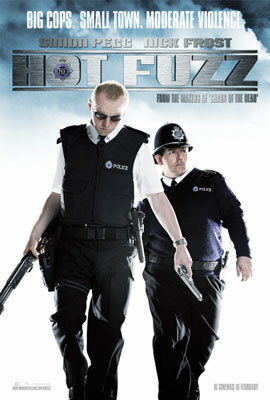 If you want to know what I thought of Hot Fuzz you can read what I said before. There seem to have been fewer DVDs loaded with extras recently. Not a bad thing because in a lot of cases it was silly – lackluster films and films that don’t innovate don’t need vast explanations of how they were made. Classic films and new films that there is something interesting to say about do. Pegg and Wright seem to have an idea of what to do with the extras. If this DVD release was a pizza it would be a deep pan meat feast with extra peperoni and 3 very hot peppers concealed under the cheese to catch you out when your not expecting them.